• The distance to your destination. • The direction to your destination. • How fast your kayak goes through the water. See Kayak Speed. • How the wind and currents will affect your ability to go at that speed. See Effect Of Wind & Tide. • How to deal with any problems and hazards that are marked on charts. See Maritime Charts. Whether you are on foot in the city or out in the wilderness, the secret of navigation is to be continuously aware of your location. For a sea kayaker this means watching the landscape as you go past and comparing it with a map or chart to identify buoys, piers, buildings, bridges and major power lines, headlands, islands, rivers, or a change in the direction of the coast. If the landscape lacks obvious features it is also worth timing your progress and checking it against distances on the chart. It can be fun to fix your position using a compass but it is rarely necessary. Sailors need formal navigation skills, and they go afloat with a shelf of books and a table to work on. For what amounts to a good free book on these techniques, see www.sailingissues.com. If you really want to get serious you can download an updated version of the 879-page American Practical Navigator by Nathaniel Bowditch from the website of the National Geospatial Intelligence Agency. Sea kayakers stay within sight of land so strictly speaking we don't do navigation, we do piloting. A sea kayaker needs formal skills only about 0.01% of the time. The other 99.99% it's just "that looks interesting, let's go and explore". Unlike a ship or sailboat, a kayak can safely stay close to shore in poor visibility, won't be damaged by bumping the occasional rock or landing on a beach, never needs to anchor, seldom encounters an adverse current that causes real problems, seldom goes more than a mile from land, and rarely goes more than 20 miles altogether. Unlike a mountaineer, a sea kayaker has the coast as an unmissable line feature or "handrail" which makes it hard to get lost. A kayaker can see and hear most hazards in plenty of time to avoid them, which is lucky because most of the rough or fast water that would worry a beginner is not shown on any chart. The national governing bodies for kayaking and sailing organize one-day or two-day courses in coastal navigation techniques, with a qualification at the end. These can be very useful, and a candidate for a BCU sea kayak leader qualification has to go on one. Here's a nice book, recommended by the BCU as supporting material for its navigation courses - Sea Kayak Navigation, Franco Ferrero, Pesda Press, 2007. It has clear illustrations and many exercises. How often does a keen sea kayaker actually sit down with a chart in order to find hidden hazards, calculate the most efficient course from A to B, and the perfect timing for a trip? Maybe two or three times a year. But it is always satisfying to arrive someplace unfamiliar, get out the chart and compass and identify the visible bays, headlands and islands, and assess the direction and strength of the tide before going afloat. The typical sea kayak trip means paddling a few miles along a fairly sheltered bit of coast which is already familiar to at least one of the group, with tidal streams of 1 knot or less, checking out a few caves or little islands, having lunch and then going back the way you came. You may need to know the height of the tide at the start and finish of your trip, so you don't have to wade through knee-deep mud. You may need to know which direction the current is flowing, so the return journey doesn't take you two hours longer than the outward one. You need to know whether there is any man-made problem such as a military or other exclusion zone. Often a quick look at the tide tables and a 1:50,000 (1 inch = 0.8 miles) map is all the navigation you need. See Maps & Charts Compared. If your day trip is in an unfamiliar area which may have tidal currents stronger than 1 knot you should spend ten minutes looking at a chart. See First, Take Your Chart... This may show that the area is entirely innocent. If not, spend an hour with the chart to be sure you understand it, and take a chart extract with you on the water. It is usually very clear how the chart relates to the actual coastline. If not, you could take a orienteering compass to help you relate the chart to what you can see. See Using A Compass Afloat. 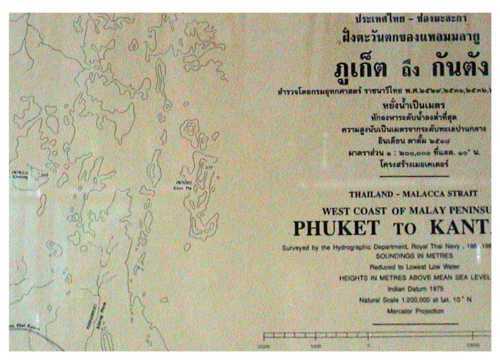 To prepare for an advanced trip you need formal navigation skills, and usually a 1:50,000 map, chart on a similar scale or 1:25,000 scale for areas with particularly strong tidal streams, wristwatch for timing, tide tables, sailor's or kayaker's pilot guide to the area, current atlas, pencil, eraser, course plotter, ruler or dividers, waterproof map and chart extracts for use at sea, a handheld compass with a fairly long baseplate, waterproof marker and whiteboard or notebook for navigational notes. • Day-trip on a coast which is exposed to ocean winds and waves. For a discussion and a case history, see Trip Planning. • Day-trip on unfamiliar waters with strong tidal streams such as you can expect in an area with a large tidal range, which includes British Columbia, Maine and north-west Europe. Expect them in particular at headlands and where an enclosed area such as an estuary or fjord fills and drains through a narrow gap. • Day-trip in a notoriously foggy area with a complex coastline or a maze of islands. • A major open-water crossing where you might miss your destination completely if it gets foggy or dark. • An expedition where you have to make efficient use of tidal streams in order to cover long distances. • Any trip with young or inexperienced kayakers in the group, unless you will be near a road the whole way. • Any trip if there is a real risk that the wind may reach Force 4 or above while you are still an hour or more from shelter. • Any trip where you will be camping overnight, because the wind or ocean swell may increase a great deal from one day to the next and require a change of plan. Seafarers of all nations measure distances at sea using the nautical mile. By international convention this is taken to be 1852 meters (1.15 land miles). A sea mile is one minute of arc of the Earth's circumference.Any circle can be divided into 360 degrees. Each degree is divided into 60 minutes. Lines of longitude are always the same length, unlike lines of latitude which get shorter as you approach the poles. On a chart, you can find the length of a nautical mile by referring to the vertical scales at the sides. See Distances On A Chart. The speed of a boat, wind or current is usually given in knots, as are coastal speed limits. A knot is one nautical mile per hour. Is better to say "knots" or "knots per hour"? Actually you can say either, but probably just "knots" is better . In the days of sail, each ship would carry a logline on a reel. The line was 700 feet of thin rope with a lump of wood at one end, and knots tied in the rope at intervals of 47 feet 3 inches. To find your speed, you would throw the lump of wood overboard and let the reel rotate so the line could run out freely. You timed it carefully with a 28-second sandglass. This was a small hourglass, basically an egg-timer. As the last grains of sand ran out, you would nip the line to stop it, and count the number of knots that had run off the reel. So really it was "knots in 28 seconds" rather than "knots per hour". If you were sailing fast you could use a 14-second sandglass instead. An experienced kayaker in a classic sea kayak can maintain a speed of 4 knots for five or six hours if (s)he is on a mission, or sprint at 6 knots for the fifteen minutes it might take to round a headland against an adverse current. Allowing for having rests and checking out interesting things, a kayak group typically travels at an average speed of 2.5 knots. Because of tidal streams and winds, a speed of 2.5 knots through the water can easily be 4 knots over the ground, or 1 knot. Or even 0.5 knots backwards. A 3 knot tidal stream will carry you along at 3 knots if you stop paddling. If you try to go against it, you will remain in nearly the same location relative to the ground, unless you sprint or find a way round the edge. Fortunately, currents are predictable. See Currents and Going Against The Current. Wind has a similar effect but is less predictable. See Leeway. You can take account of both factors when planning a trip. See Adjusting Your Plot For Currents and Adjusting Your Plot For Wind. When you are on the water it is usually easy to check whether you have done this correctly. See Navigation Checks While Afloat. For kayakers, the main use of navigation marks such as buoys is to recognize the deep-water channels where larger boats and ships must go, so we can stay clear of them. Channels are marked with buoys along the edge. The appearance of these lateral marks depends on the "conventional direction of buoyage". Lateral marks of one shape and color are used to mark the starboard edge, which is the right side "when approaching a harbor, river, estuary or other waterway from seaward". It's basically the direction of the main flood tide. Buoys of a different shape and color are used to mark the other ("port") side. A useful mnemonic in English is that port has the same number of letters as left. North America, South America, the Philippines, Japan and Korea use the IALA-B system of marking channels. Green square shapes, usually green can buoys, are used to mark the port side of the channel and red conical or triangular shapes, usually red nun buoys, for the starboard side. The mnemonic is "right - red - returning". 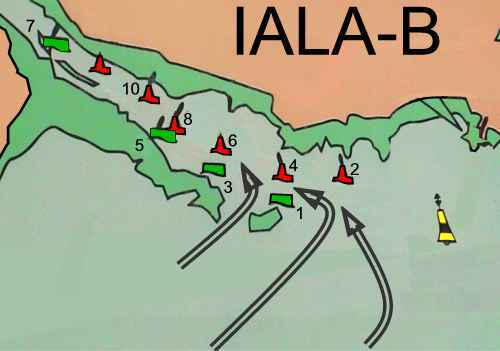 The diagram shows the mouth of a river in the IALA-B zone. The arrows show the direction of the incoming tide. Red nuns on the right. Buoys in more important channels are numbered, starting at the channel entrance so the numbers get higher the further upstream you go. Important buoys may be named. A particularly important lateral mark may be an imposing permanent structure. Most lateral marks are buoys which float and are kept in position by a chain leading down to a heavy weight on the sea bed. A port buoy for an unimportant channel may be made from an old bucket painted green. The one below is at the water's edge at low tide, on a post 19 feet high to ensure that it is still visible at high tide. Small, quiet, muddy channels are often marked with unpainted wooden poles hammered into the edge of the deepest channel. Note: A different lateral buoyage system is used in the rest of the world. The IALA-A system uses square red shapes are for port and green conical shapes for starboard. Full details of both systems are available from the IALA website. Last time we looked, the download page was here. Yellow buoys are used for special features which generally means recreation zones (keeping swimmers and powerboats apart); traffic separation schemes in busy commercial channels; fish farms; and exclusion zones such as military firing ranges and wildlife sanctuaries. A small hazard such as a wreck or isolated rock may be marked with a single buoy, usually red and black, directly above it. A larger hazard such as a wreck, reef or sandbank may be marked with a cardinal buoy. The shape and color indicates whether the hazard is to its north, south, west or east. From a kayaker's point of view a hazard to shipping is probably so far underwater as to make no difference but some are interesting to visit, good for surf or a safe refuge from ships and powerboats. There is a cardinal buoy on the IALA-B diagram above. It draws attention to a sandbank which defines the southern edge of the main channel. It is an east cardinal, which means it lies on the eastern side of the hazard. That sand spit is actually good fun for kayakers because it often has a little surf. The diagram may give the impression that a hazard would be surrounded by cardinal marks. Usually there is only one per hazard. There are many other navigation marks and beacons, visual, audible and radio. In practice, sea kayakers seldom need to be identify a navigation mark. But they are interesting things. A big navigation buoy is physically impressive, especially if there is a strong current running, and it is a great experience to visit a lighthouse on a small island. Ports near the mouth of some rivers in the Pacific northwest have flashing amber lights to warn that rough conditions can be expected on the way out. See Waves At A River Mouth. Harbor authorities in most naval and commercial ports have legal powers to regulate all traffic including leisure craft. They will expect kayakers to comply with exclusion zones and probably with traffic control signals at the harbor mouth. Three green lights arranged vertically, or green, green and white arranged vertically mean that small craft can go in and out of the harbor. Three red balls or lights arranged vertically mean "no entry (or exit)".That is the normal setting in some busy ports. If they're flashing it means "emergency, no entry (or exit)". We have been told that port control at Dover, England, will send a patrol boat after you if you leave against the lights. At St Peter Port on the English island of Guernsey the rules expressly don't apply to vessels under 49 feet long. No doubt many ports ignore kayakers as long as we don't actually impede commercial traffic. Port entry signals are supposed to be international but in fact they vary from place to place. In Tallinn, Estonia, a red light located on the North Quay at the harbor entrance means no entry and a green light gives permission to enter. Small ports in France may display only a single red light or red flag, or a single green light or green flag. Red means no entry. Green doesn't mean go, it means no exit. Red plus green means no entry or exit. At St Peter Port a red light at the pierhead and on the south end of the jetty and Inter-Island Quay prohibits entry and exit. Ramsgate, England, does use the international signals but also has flashing orange lights to warn of large ferries arriving or leaving. In Scotland, Aberdeen uses a green light to mean no entry into the navigation channel for vessels proceeding towards the harbor, a red light to mean no entry for vessels proceeding to sea, and red plus green to mean no entry either way. On the Clyde when the Queen's Harbour Master puts up three vertical green lights near the Faslane nuclear submarine base it means the opposite of what you might expect - leave area immediately. OK, port control signs are in a state of total anarchy, we give up. You can find out the rules for any particular port, and the VHF radio frequency for Port Control, by referring to the chart and a pilot guide. A fixed navigation light may be on a lighthouse, a lightship, a buoy or just a pole at a harbor mouth. It can be recognized at night by the unique characteristics of the light. A white light is used for long distance visibility, and red, green or yellow are used for marks intended to be seen from close up. Some navigation lights are on continuously but most go on and off in a fixed pattern. An isophase light is light and dark for equal periods; a flashing light is dark most of the time; and an occulting light is lit most of the time. Flashing speeds also vary. There is long flash, flashing, quick flashing, very quick flashing, and ultra quick flash. Some flash continuously, others give a group of flashes and are then dark for a few seconds. If you can see a navigation light, there are probably half a dozen marked on the chart in that approximate location but the chart will tell you which one you are looking at. For example it may say that a particular light is F(3).Y. 15s 4m 3M, that means it has a group-flashing yellow light with a total "period" of 15 seconds. So, it flashes three times and is then dark until the cycle starts again, 15 seconds later. It is mounted 13 feet above the water and is bright enough to be visible from a distance of 3 nautical miles in good weather. For more about the way lights are shown on the chart, click here. As previously mentioned, three red lights one above the other at a harbor entrance mean no entry or no exit. At night, vessels are required to display a white light which is visible from all around. Large vessels have two white masthead lights which can be seen from in front over an arc of 225 degrees. The aft light is higher. They may also have a single white stern light visible only from behind. Vessels 12 meters (40 feet) or more in length are also required to display two sidelights when moving. Most cruising sailboats and some powerboats voluntarily display smaller sidelights. Each sidelight can be seen over an arc of 112.5 degrees. They are red on the port side, green on the starboard. The port side of a ship is the left side when you're standing on it looking forwards. All navigation lights have to be bright enough to be seen two miles away in good weather. Regardless of the white lights, if you can see red and green at the same time, a vessel is coming directly towards you. If you can see only green, the vessel is probably approaching, and certainly going from your left to your right. If you can see only white, it is going away from you or is stationary.